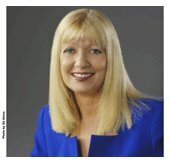 Pat Wyman is the founder of HowtoLearn.com, university instructor, best-selling author of several books and known as America’s Most Trusted Learning Expert. She is deeply committed to helping children succeed in learning and in life. Her books include two worldwide books – Smarter Squared: How to Use Personalized Learning to Master School Faster and Create the Future YOU Want! 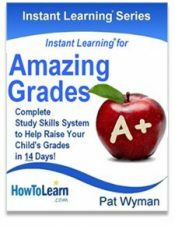 and Amazing Grades:101 Best Ways to Improve Your Grades Faster. 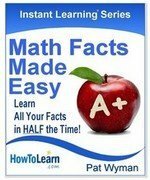 Additionally, she wrote; Instant Learning for Amazing Grades a complete study skills blueprint for grades 1-8; Spelling Made Easy: Learn Your Words in HALF the Time; Math Facts Made Easy: Learn All Your Facts in HALF the Time, Learning vs. 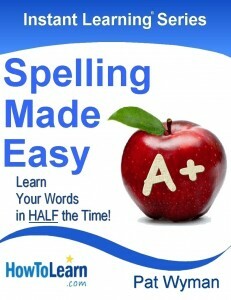 Testing, and is the co-author of two books about autism. Wyman created the Personal Learning Styles Inventory and will answer your questions on faster learning, learning styles, dyslexia and reading in her private facebook group, Your Learning Questions Answered. 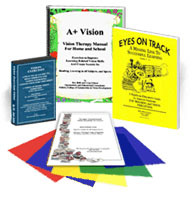 Parents say Pat Wyman diagnoses and solves learning problems in a way that gets to the real cause of the problem and that she offers the most effective and unique solutions that make all the difference in their child’s life. Wyman is also the recipient of the James Patterson Page Turner Award for her global work to enhance literacy. 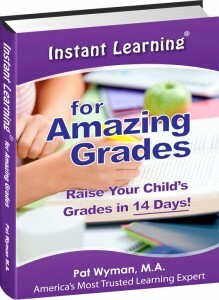 Complete Study Skills System to Help Raise Your Child’s Grades in 14 Days!